Here comes the big one! 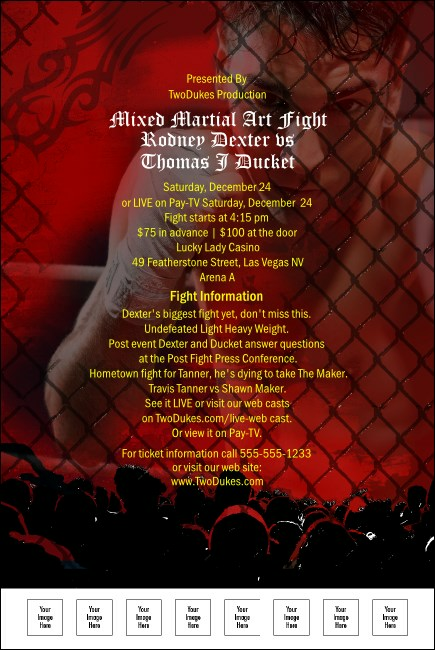 Poster for our Mixed Martial Arts Event Kit in red features a fighter with his jaw and his fist clenched, with a chain link and tribal background and a foreground full of fans ready for blood. With space to upload eight of your own images to the template, this is a fast and easy way to advertise exhibitions, tournaments, fights, and other karate, kickboxing, and martial arts events. No competition here! TicketPrinting.com is at the top of the game.